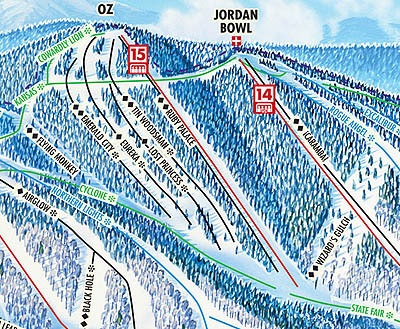 The conclusion of the massive Sunday River build out of the 1980s and 1990s, the Oz complex was formally opened in 1995 (though some skiers would pass through the area on their way to the 1994 Jordan Bowl development). Though there were novice connector trails at the top and the bottom of the area, Oz was primarily developed as an expert area, including double diamond glades. A new Doppelmayr fixed grip quad, climbing 1,051 vertical feet over a run of only 2,954 feet, was installed to the highest lift served peak at Sunday River.